Decoders Pricing ESU Products Other info. This is your locomotive This is your locomotive with LokSound! prices for multiple units and programmers purchased with decoders. Custom sounds and installation available. your locomotives from analog to DC (permanent magnet) motors. LokPilot2, LokPilot mfx, Loksound v3.5, Loksound v3.5 mfx, etc. Analog Back EMF (=DC back EMF) The LokSound V3.5 controls the motor with back EMF function also in DC mode. Therefore the user will have full control over the motor also in DC mode. User can set the minimum speed, the maximum speed, the acceleration time, the deceleration time. Further, the slow running performance will be much better. Doppler effect LokSound V3.5 offers a Doppler function. This can be activated by the horn /whistle key. User-adjustable Sound volumes With LokSound V3.5 the user can individually control the volume for prime mover (=diesel/steam), horn/whistle, Bell and the auxiliary functions. This can be done by adjusting CVs. Further, a user can control the volume of the decoder by using a function key of the command stations throttle. No need for programming! By just adjusting a single CV value. The decoder that enables / disables certain functions: for example in a consist, the horn and bell is active on the first engine only, whereas the prime mover sound is on for all engines. F13 to F20 According to latest editions of NMRA DCC, we have integrated function keys F13 to F20. Consist mode CVs For LokSound V3.5, the user can now influence the behavior of the function keys by CV 21, CV 22. These CVs are added. Load-dependent-sound The load-Dependent sound can be switched off. The LokSound2 fits neatly in a Marklin Swiss 460 Electric engine! LokSound2 decoder available since 2001 succeeds the LokSound “Classic” decoder and can be used for H0 and 0 gauge as well as small gauge 1 engines. 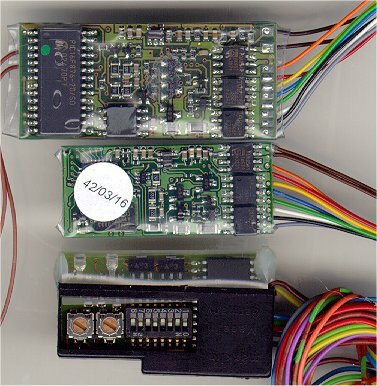 The decoder recognizes the DCC- and Motorola protocol, can be operated in analog AC or DC mode and controls AC (universal) / DC.- and coreless motors. 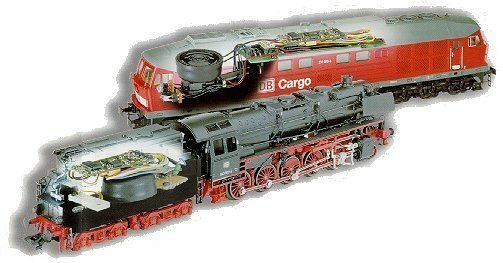 It’s biggest strength is the second generation load control as well as numerous programming possibilities with DCC and Marklin systems. LokPilotDCC is the second generation of LokPilot for the discerning DCC user. LokSoundXL is the consequent development of the revolutionary LokSound concept and our answer to the demands of modelers of larger gauges. The LokSoundXL decoder has been equipped with all features necessary for optimal operation of G and 1 gauge models. There is a speaker for every decoder. As the speaker is crucial for excellent sound reproduction, we have developed a large range of specially matched speakers for each decoder type. The LokProgrammer perfectly complements our decoders. LokProgrammer is ideal for setting all CVs as well as sound effects easily and comfortably. "Digital command control with original sound"
This motto best describes the LokSound-decoder family. All LokSound decoders combine a high quality digital decoder and a digital sound module. You can drive your locomotives digitally and at the same time replay the original sound of your locomotive as well as special sound effects such as horn or whistle. The combination of the digital multiple train mechanism with the original sound offers a range of possibilities which convince everybody. The sound is adjusted to the particular driving mode at any point in time: when the loco starts moving, you hear the appropriate sounds (diesel engine revving up, steam chuffs with increasing frequency) and when it stops, you hear the engine slow down and also braking sounds. 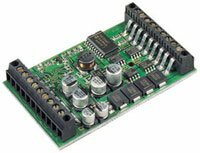 You won’t have any problems with space within the model as one circuit board combines decoder and sound module. It offers all features and functions, which you could expect in a decoder today, and many more. are easy to operate. Free function mapping allows assigning most outputs to any function key. Realistic sounds – as in the real world – can easily be reproduced with the sound module, because the original sounds are memorized digitally on a chip. The sound module offers a new and fascinating model world full of sound. Synchronized chuffs matching the speed of the locomotive vary in pitch, volume and frequency. Sound speed can be synchronized with the drivers by means of external sensors or by speed step control. The large capacity of the memory chip allows complex sound effects (e.g. typical noise of a stationary steam engine: coal shoveling, water pump, steam release, dynamo - at random) makes your model train more authentic than ever. The reproduced sounds is adapted to the particular driving mode. Up to 6 individual sound effects can be triggered with the function keys. Any memorized sound fragment can be changed any time. 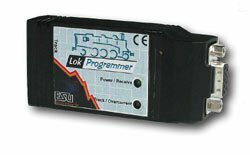 The LokProgrammer allows the recording of individual sound fragments and thus allows you to create your on personal sound files and effects. To suit the variety of models in different gauges LokSound-decoders are available in various sizes.